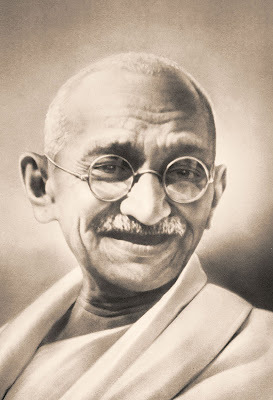 Knights of Creativity Spirit & Ale: I wonder what good Gandhi would have done with nearly $2 million in his pocket! I wonder what good Gandhi would have done with nearly $2 million in his pocket! Indian beer magnate buys Gandhi's glasses. An Indian beer and airlines magnate placed the winning $1.8 million bid Thursday in New York for Mahatma Gandhi's spectacles and other personal items. Tony Bedi, representing Vijay Mallya, who owns the company that makes Kingfisher Beer, did the bidding and said that the items will be returned to India for public display, The New York Times reported. He said that Mallya has not yet decided whether to give them to the government. The Indian government tried to stop the auction at Antiquorum Gallery in New York. On Thursday, officials said that the government would not put in a bid but would ask Indian-Americans to secure the items. James Otis, a California peace activist who had consigned the Gandhi belongings to Antiquorum, tried to stop the auction at the last minute. Antiquorum refused. Shyan Gulati, who heads Infopeople Corporation, said that the crowd at the auction included many well-heeled leaders of New York's Indian community. About a dozen people joined the bidding in person in addition to others who had placed written bids or entered them by phone. "Anything when it comes to Gandhi is emotional, sentimental and patriotic when it comes to Indians," Gulati said. In addition to Gandhi's eyeglasses, the items on sale included a pocket watch, a pair of sandals and a plate and bowl. 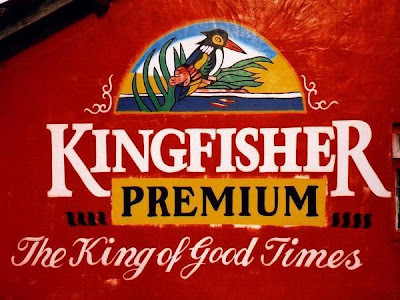 A name synonymous with Beer in India - Kingfisher stands for excitement, youth and camaraderie. The Beer brands manufactured and marketed by United Breweries Ltd. have always been recognized for their international quality. That's Beer at its best for the discerning consumer! Kingfisher, the bird is known for its keen instinct, and perfect aim. It zeros on its target with unfaltering focus. It is a very vibrantly coloured bird. All of its colours represent energy, youthfulness, enthusiasm, freedom with a touch of formality and discipline. No wonder, that this bird with an eye for right focus and an aim for succeeding in its attempt became the mascot for The Kingfisher brand of Beer from the stables of UB group. Since the launch, Kingfisher Beer has become one of the largest selling beer brands in the world. "It's flying" and the mood is upbeat - both within the Company and among consumers. I believe that Gandhi would have preferred that they gave the glasses away and spent the 2 million on the poor. Kingfisher is an excellent beer!